This simple guide to hardwood types and styles will help you start understanding what might be best for your home and lifestyle. Stop by the showroom to check out samples and chat with us about what hardwood flooring can do for your home. Solid hardwood is typically a ¾” thick slice of wood. 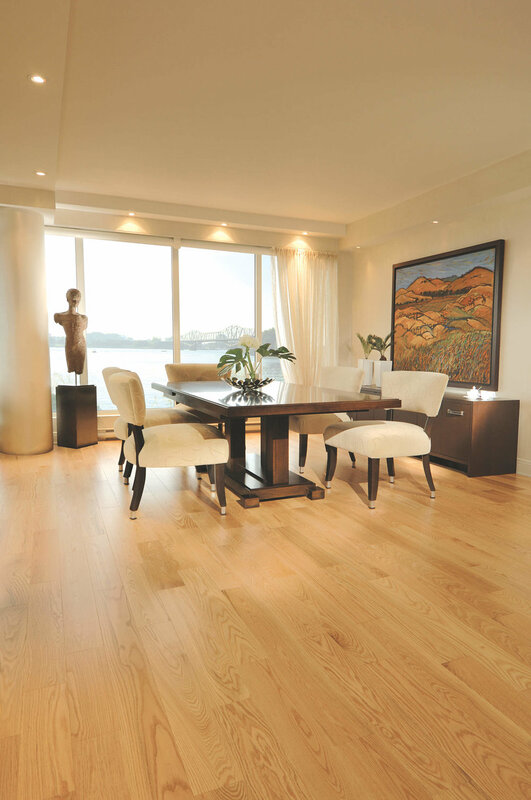 Engineered hardwood is a slice of real hardwood over a plywood, soft wood, or other layered base. 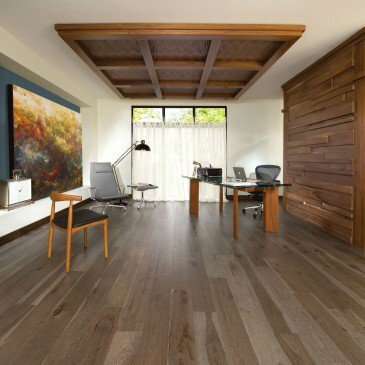 Engineered hardwood is dimensionally stable, allowing you to choose from a variety of wide width boards such as 5”, 6” or more! As for solid hardwood we recommend no wider than 4 ½” planks. Solid hardwood requires specific sub floor requirements, where engineered hardwood can be installed over a multitude of sub floors. Both you may be able to refinish, and both offer the same surface durability. If you’d like to read more into the pros and cons of solid vs. engineered, check out our Engineered Vs. Solid hardwood page. Prefinished floors are hardwoods that are installed with a finish and/or stain already in on the wood. Often these finishes are UV cured or oiled and wear excellent! No need to move out of your home as hardwood is being installed, no fumes or off gassing will occur. Sand in home hardwood is installed unfinished with no stain or finish. Once the raw wood is installed, the floor is stained and finished in home using chemical or water-based finishes. A sand in home craftsman may recommend the home to be clear of people and pets while the stain and finish is being applied. Koeber’s only installs prefinished hardwoods but can recommend a company to sand in home. To achieve this look, a hard-bristled wire brush is used over the surface of the hardwood. This pulls out a natural looking, soft grain in the wood. Wire brushed textures are recommended for active homes with pets and children as the accidental scratches and dents are masked better and blend in. This texture has become one of the most popular looks in flooring. 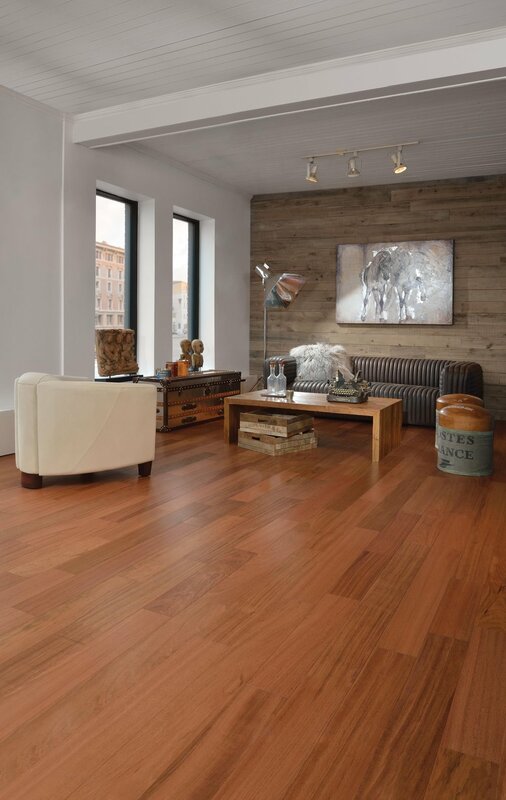 Hand scraped floors range from soft to heavy scraping along the surface to achieve a rustic or reclaimed wood look. Ideal for active homes, pets, children, etc as well since it hides dents and scratches more. Homerwood hardwoods even offer heavy amish hand scraped styles. 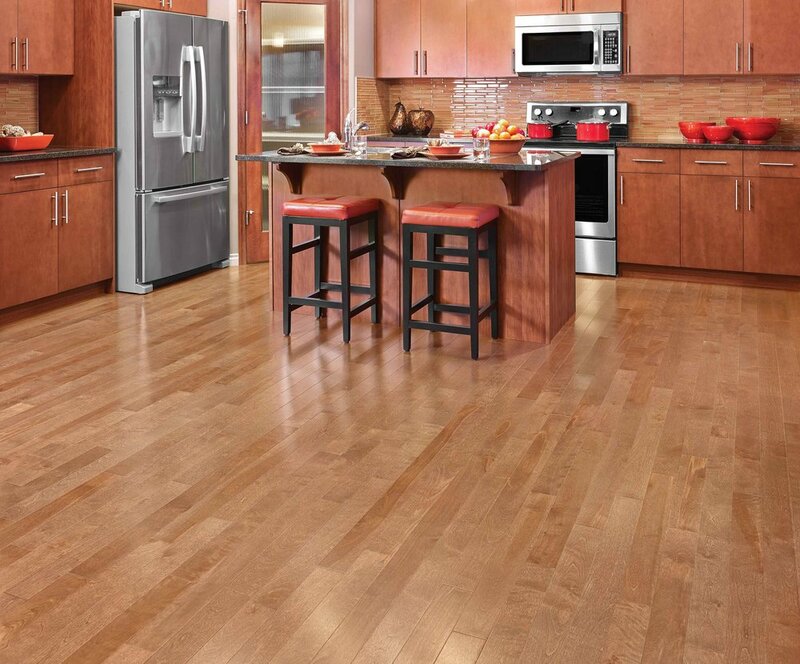 You’ll notice there are many options in sheen finishes when it comes to prefinished hardwoods. There’s everything from traditional high gloss to low luster matte finish and everything in between. A low luster finish such as cashmere or matte tend to mask dents and scratches more, where a gloss typically reflects them. Depending on your homes usage and traffic and look you’re trying to achieve there are many options we can help you navigate which may be best. Read about Mirage Floor finishes. Hickory is a dense, coarse wood. The natural grain is generally large in scale and color tone varies widely from dark brown to light blonde or golden. Hickory also features knots and sapwood that accentuate its natural beauty and character. Hickory is often stained to many beautiful shades as well. Because this floor has lots of variation and grain, dents and scratches tend to blend in nicely, especially when you choose a hand scraped texture. Maple has a clean, soft, even texture. Grain is often straight but may lightly wave through the boards. Often the color variation is pronounced when shown in a natural state but evens more when it’s stained. You may see some character maple with heavy sapwood and variation, while other mills try to keep the part of the tree with even color and less variation. Because oak grows slowly, it typically has many growth rings showing an even grain throughout each board. Variation is relatively low but will change moderately overtime to a slight amber tone. Color ranges from light cream color to brown or gray/brown. Sapwood and knots may show as well. Overall this wood is straight grained and medium coursed texture and the strands of grain range longer than red oak. Similar to white oak, red oak has an even grain. Even when exposed to light, color variation is limited. Natural color ranges from reddish brown to pale cream/ beige. 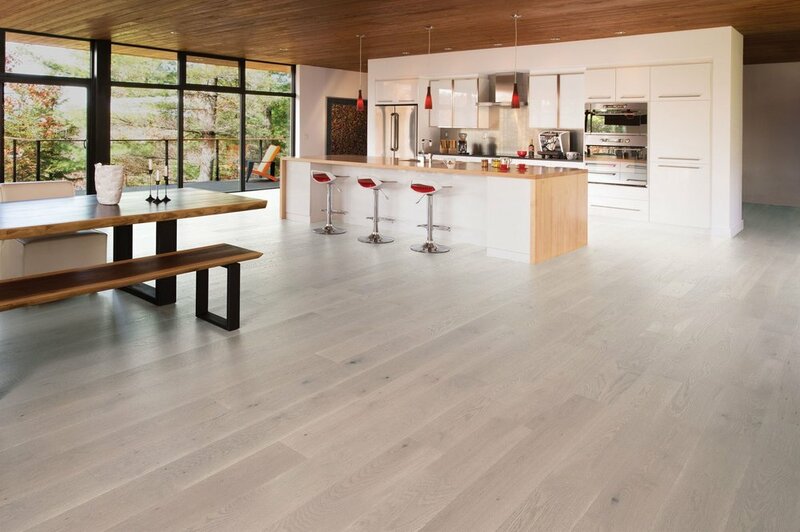 Norman wear in an active home is hardly noticeable on oak flooring due to the even, open grain. 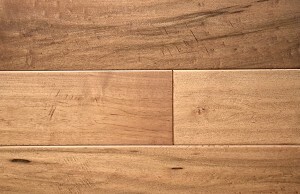 Red oak takes a stain wonderfully and is available in a multitude of colors from white wash to dark browns and grays. This species shows a close, straight grain with even texture. Boards often have a wavy look through them. Natural color of yellow birch is a cream/ yellow tone or pale white/ peachy look. The sapwood can be reddish brown. Minimal variation will occur with UV light. Stained yellow birch is one of our most popular looks as it embraces a beautifully natural variation of light and dark without being too overpowering. Depending on grain or texture of the birch you’re looking at, marks may show more. The color variation in walnut is very pronounced and simply a “wow” floor. The sapwood and heartwood results in significant differences between light and dark color and grain between boards. Walnut does tend to lighten a little over time. The natural color ranges from creamy white/ blonde to rich dark brown or even black. Walnut is one species that we do take hardness into account. Its moderate hardness is important, and we’d want to assess the usage where it’s being installed before looking into this option for you home. The golden luster ranges from dark stripes to light golden/orange or red tint. The texture in grain ranges from medium coarseness to interwoven long strands between boards. Color variation becomes more pronounced with UV exposure. You’ll mostly see this floor in a natural state rather than stained. Stop by the showroom to check out samples and talk more in detail about hardwood flooring. Older PostDoes your home need Pet Protect carpet?